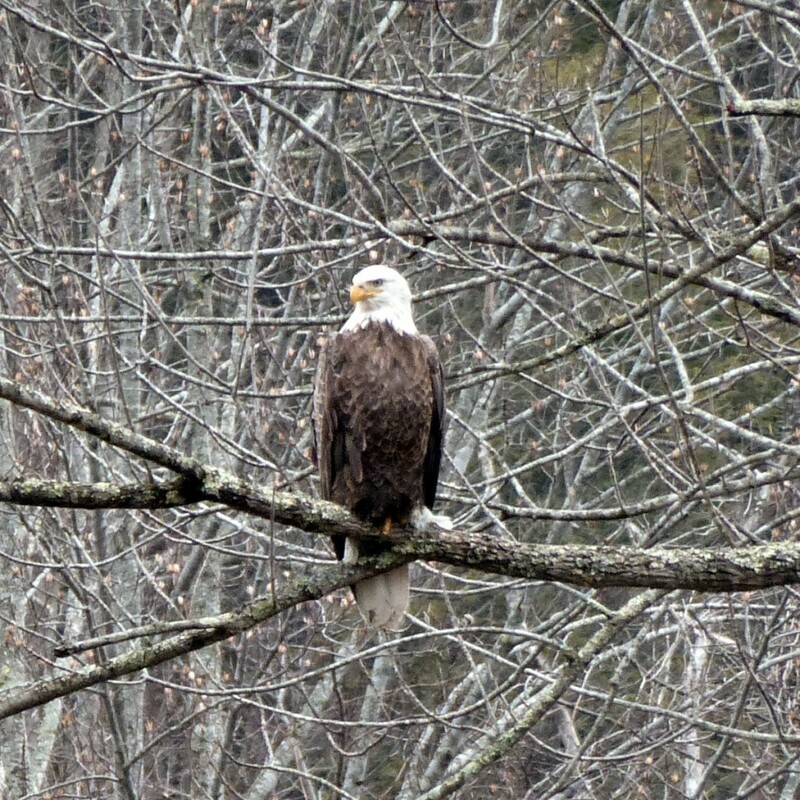 Bald Eagles are not spotted very often in our neck of the woods inside Pisgah National Forest east of Asheville. In fact, we note just a few sightings in the Asheville area since January of this year on eBird. 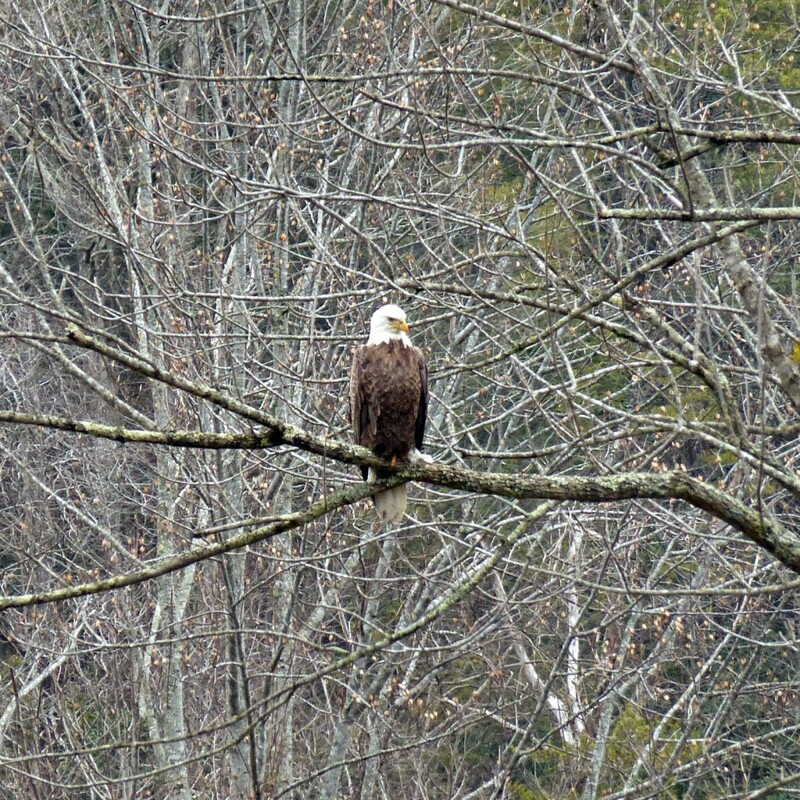 After a friend told us that he had seen a bald eagle for about a week near our Bed & Breakfast, curiosity got the better of us and we headed out today to take a look. Sure enough, there it was, perched in a tree along Mill Creek Road near a pond, about two miles from the Inn on Mill Creek B&B, in Old Fort (McDowell County, North Carolina). Once abundant in North America, the species became rare in the mid-to-late 1900s—the victim of trapping, shooting, and poisoning as well as pesticide-caused reproductive failures. In 1978 the bird was listed for protection under the Endangered Species Act. Since 1980, gentler treatment by humans along with the banning of DDT (the bird’s main pesticide threat) have led to a dramatic resurgence. By the late 1990s, breeding populations of Bald Eagles could be found throughout most of North America. In June 2007, the bird’s recovery prompted its removal from the Endangered Species list. Have you ever seen a bald eagle in your area? This entry was posted in Birding in the North Carolina Mountains and tagged birding, Old Fort by Inn on Mill Creek. Bookmark the permalink. Taking a short hike up Katsuma after lunch today, we saw a bald eagle on the west side of the ridge (just E of the conf. center, flying S across I40).Unfortunately, my camera was zipped into my pocket. We were so close, maybe just 50 yards. Magnificent! That is awesome! Wonder if it’s the same one we have seen the past two springs…we will keep an eye out. Thanks for sharing!